Republicans in the US House of Representatives have voted to weaken the body that investigates claims of misconduct against members of Congress. 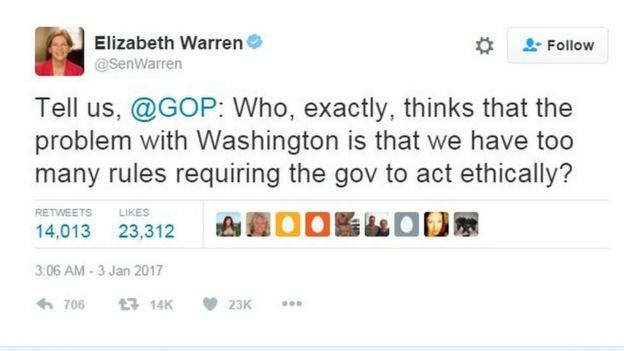 Under the change, the independent Office of Congressional Ethics would come under the control of the House Ethics Committee. Democrats reacted angrily to the vote. The proposals, tabled in an amendment to House rules by Congressman Bob Goodlatte, would weaken the body’s oversight of matters such as conflicts of interests and financial impropriety. If the new rules package is voted in – as is likely as the Republicans have a clear majority – the Office of Congressional Ethics (OCE) would be renamed the Office of Congressional Complaint Review. Democratic leader in the House, Nancy Pelosi, said the amendment to the rules would effectively destroy the Office of Congressional Ethics (OCE). “Republicans claim they want to ‘drain the swamp,’ but the night before the new Congress gets sworn in, the House GOP [Republican Party] has eliminated the only independent ethics oversight of their actions,” she said in a statement. “Evidently, ethics are the first casualty of the new Republican Congress”. During his election campaign, President-elect Donald Trump repeatedly vowed to “drain the swamp” of Washington politics, claiming the federal government was corrupt and dysfunctional. He has not commented on the proposals for the ethics body. How might Trump ‘drain the swamp’? While House Speaker Paul Ryan and Majority Leader Kevin McCarthy were reportedly opposed to the amendment, Rep. Goodlatte – chair of a House committee – introduced it anyway. Grassroots anti-corruption organisation Common Cause described the move as “an unacceptable step backwards” by House Republicans. Why was the OCE set up? 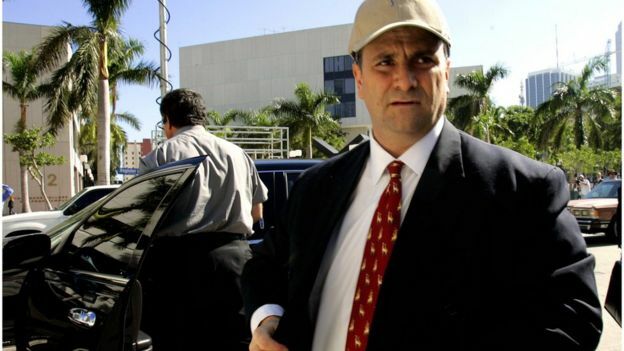 The OCE was created in 2008 after a series of embarrassing scandals, including that involving lobbyist Jack Abramoff who was jailed for conspiracy and fraud. Ms Pelosi – then leader of a Democrat-controlled House – spearheaded the efforts to reform oversight of Congress and shed light on the often murky world of Washington lobbying after the Abramoff scandal. Other notable cases in the preceding Republican-controlled Congress were those involving once senior Republican Representative Tom DeLay (whose conviction for money laundering was overturned on appeal) and fellow Republican Randy Cunningham, jailed for eight years in 2006 for taking bribes. Once Mr Trump is inaugurated on 20 January, the party will control both Congress and the presidency for the first time since 2007. How come the House gets to decide on its own ethics oversight body? The US constitution says that “each House may determine the Rules of its Proceedings”, so at the start of each new Congress, the House of Representatives has to approve its own rules and regulations. The House of Representatives is the lower house of the US Congress and all its 435 members are elected every two years.